Competitive analysis is a fundamental step in defining both product and sales strategy, and allows product managers and business leaders alike to take stock of their position in the market relative to similar competing products and offerings. From a product perspective this gives product managers new insight into how their product’s features compare to their closest competitors, helping them to identify and prioritise features that will improve the product’s positioning against the competition. Over and above the feature centric view of product managers, sales and corporate leadership rely on competitive analysis to understand the strengths and weaknesses across a competitor’s entire organisation, including scalability and performance, product or service quality, financial stability, the management team, existing customer base and their ability to deliver services. In both cases the objective is to identify and implement strategies through which you can be more effective with your product positioning, product differentiation and brand positioning, with the ultimate goal being to turn competitive intelligence into more product sales. What’s in a Competition Analysis? C ommon techniques for performing competitive analysis are to create detailed “competitor profiles” on each of your competitors by looking at key attributes including background, finances, products, markets, facilities, personnel, and go to market strategies. While product managers will tend to hone in on product attributes such as competitor product line vision and value proposition, sales and marketing teams will additionally consider market and customer attributes including market segmentation, customers, pricing, licensing and distribution channels. 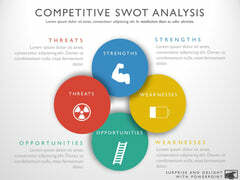 Another popular approach to understanding your competitive position is to combine characteristics that are internal functions of your own business and product line with the external traits of competitors and your chosen market into one of the most widely known competitive analysis tools called a SWOT matrix. This competitive strategy profile helps you to focus in on your own strengths and identify new product and market opportunities, while at the same time addressing the weaknesses in your product or business strategy and threats posed by your competitors or changes in the market. When it comes to exploring your competitive landscape the exercise of gathering useful competitive facts and accurate market data can consume a significant amount of time. Once you’ve gathered all your data you’ll want to transfer your new insights into a data presentation format that optimally supports your chosen analysis technique but is also great for presenting and sharing with your wider organisation, particularly senior management. In this section you’ll find a range Powerpoint presentation templates specifically designed to support structuring your data for a highly presentable and easily messaged competitive analysis. This includes a large selection of competitive profiling templates for comparing product or business attributes, SWOT analysis templates for mapping out your internal and external competitive strategy and many other analysis and data projection formats. With every template you will find video instructions on how to do a competitor analysis using the selected competitive analysis ppt.